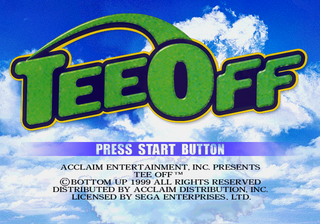 For the Sega Saturn game known as Tee-Off! during development, see Virtual Golf. Tee Off, called Golf Shiyouyo (ゴルフしようよ) in Japan, is a 1999 golf game by Bottom Up for the Sega Dreamcast. Main article: Tee Off/Magazine articles.